Rising income level, increasing internet penetration, growing number of pay-tv subscribers as well as wide functionalities and features offered by Smart TV vendors are some of the key factors which are driving the growth of India Smart TV market. With number of players emerging in this segment and surge in awareness level, the contribution of smart TV market to total sales of the TVs have increased significantly in the country. According to 6Wresearch, India smart TV market size is expected to grow at a CAGR of 30.2% during 2018-24. Households in India are at a cusp of transition and a shift in preference has been witnessed from conventional TV sets to smart TV sets. Changing lifestyle of middle income population is attributed to rise in income level, increasing awareness, adoption of new technology and increasing internet penetration. Additionally, government initiatives primarily in tier-II and tier-III cities are some of the key factors which are likely to bolster the growth of Indian smart TV market forecast period revenues. Amongst all the verticals, the residential vertical captured the highest India smart TV market share in 2017. The residential vertical is likely to maintain its dominance over the next few years as well and is likely to witness a relatively higher growth as compared to the commercial vertical. 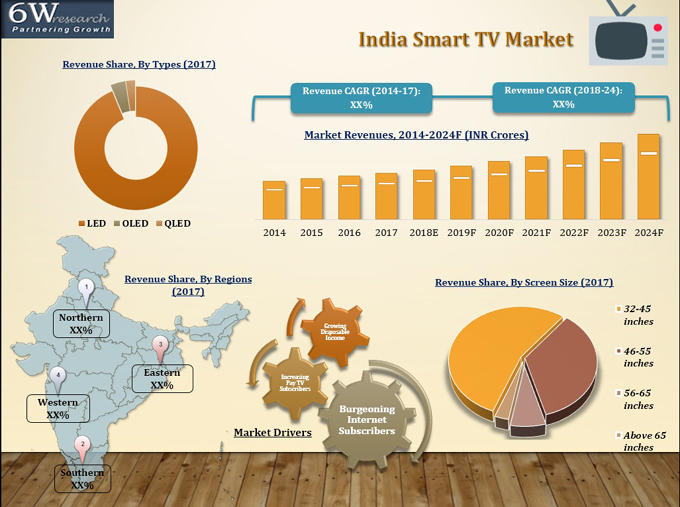 The India smart TV market report thoroughly covers the Smart TV market by resolution, screen type, screen size, verticals, distribution channels, technology and regions. The India smart TV market outlook report provides an unbiased and detailed analysis of the India smart TV market trends, opportunities/high growth areas and market drivers which would help the stakeholders to device and align their market strategies according to current and future market dynamics. 15.1 Panasonic India Pvt. Ltd.
15.2 Samsung India Electronics Pvt. Ltd.
15.3 LG Electronics India Pvt. Ltd.
15.4 Sony India Pvt. Ltd.
15.5 Xiaomi Technology India Pvt. Ltd.
15.7 Vu Technologies Pvt. Ltd.